I used to play the trumpet as a kid, and I miss the feeling that comes from creating music. I harbor a little fascination for the harmonica and added “learn to play harmonica” to my list of goals a few years ago. That goal finally bubbled to the surface last year but I never “got around” to acting on it. I resolved to make it happen this year, though I didn’t know where to begin. Then the universe literally gave me a sign. 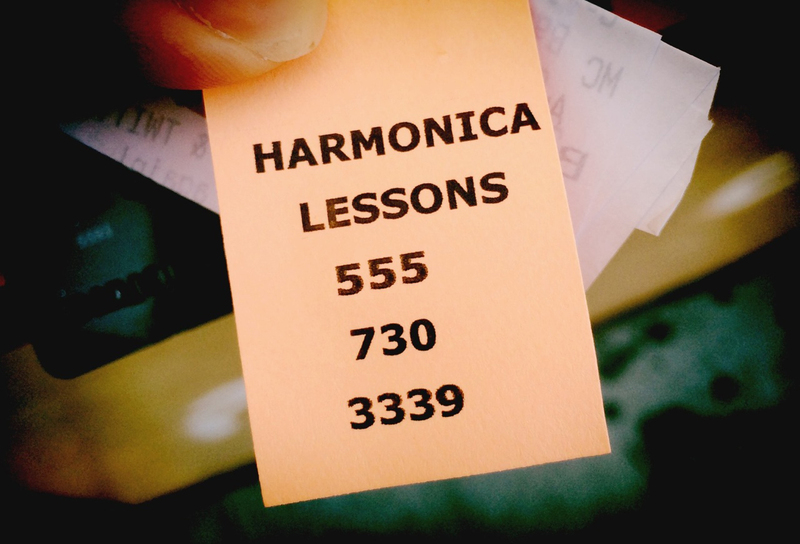 Someone posted “HARMONICA LESSONS” fliers on all the lamp posts in my neighborhood. Thanks universe! I dutifully tore off a tab with the instructor’s phone number and stuck it in my pocket. It stayed in my pocket for 3 months. I would find it every other week or so and say, “Man, I should really get on this.” But I never did. This was something I genuinely wanted to do, but I wasn’t doing it. I had even promised it to myself as a reward for finishing up the marketing class I was teaching. Why was I dragging my feet? I was mentally reprimanding myself about this yesterday when a little voice popped into my head and gave me a whole bunch of excuses for not starting my lessons yet. It squeaked out, “Well, you don’t know how much it costs. You don’t know where it is. You don’t know how easy it will be…” I cut it off after the fourth of fifth excuse. I realized my problem. I didn’t have enough information, so I wasn’t doing anything. I was trapped in a state of not-knowing and it was preventing me from moving forward. This seemed especially preposterous to me because I had the answers in my back pocket. All I had to do was call the number! Jenny was really nice. Lessons are $45 dollars. She’s an old pro at this and said I’d be playing blues, rock, and campfire ditties after only a couple lessons. We checked our calendars and scheduled a time for our first lesson: next Thursday. It’s crazy to me that it was so easy to move forward, yet I put it off for over 3 months. That’s how powerful “not knowing” can be. It’s an easy excuse and a strong demotivator. I didn’t know how much effort was involved. As far as I knew, learning the harmonica could have required years of practice and thousands of dollars in private lessons. No wonder I wasn’t rushing to make that kind of commitment. But it wasn’t that big of a deal. Most things aren’t that big of a deal. Over the last few years I’ve gotten really good about not procrastinating. But the tasks I still put off seems to fall into this recently-discovered-category of “nebulous commitment.” They all turn out to be easy once I finally get to them, but I delay them for so long because I don’t know how much effort they require. For example, I have an eBook I want to publish on Amazon. I did all the stuff I knew how to do, including writing and designing the book. That’s the hard part! But I haven’t uploaded the damn thing to Amazon because I don’t know how to do it. The process is unknown to me so it feels like a mountain of effort. It’s probably really easy. In fact, Amazon wants it to be easy so more authors upload books. That’s all the info I need. There’s even a handy yellow “Add New Title” button! Ok lesson learned. Next time something languishes on my to do list for too long, I need to take the first step, which is to find out the rest of the steps. Flip on the light and the boogeymen disappear.